Dies R Us: Gather Summer While You Can! I hope you are already well on your way to a fantastic week! It's hard to believe that it is almost September already, isn't it? Where has the summer gone! I thought I would share a simple card with you this morning that I like to call "Gather Summer While You Can!" There won't be too many more days when we can gather summer flowers and enjoy their beauty! The image I used for this card was from Cornish Heritage Farms & would be perfect for any number of different occasions from birthday & get well to just thinking of you. I used just two dies on this card, Spellbinders Elegant Ovals and Sue Wilson Cordoba. I love to mix & match my die sets to create totally different looks! I hope you enjoyed today's bit of inspiration and have checked in with the other design team members too! Be sure to give the Dies R Us Challenge Blog a visit! Once you do, I'm sure you will want to join in for the chance to win a gift certificate! Well, I'm off to check out the Dies R Us store again! LOVE that place!! All the die companies & brands I love most all under one roof & the lowest prices around! One stop shopping at it's finest! See you next week with a Christmas card! Until then, happy creating!! Beautiful card Sherri! 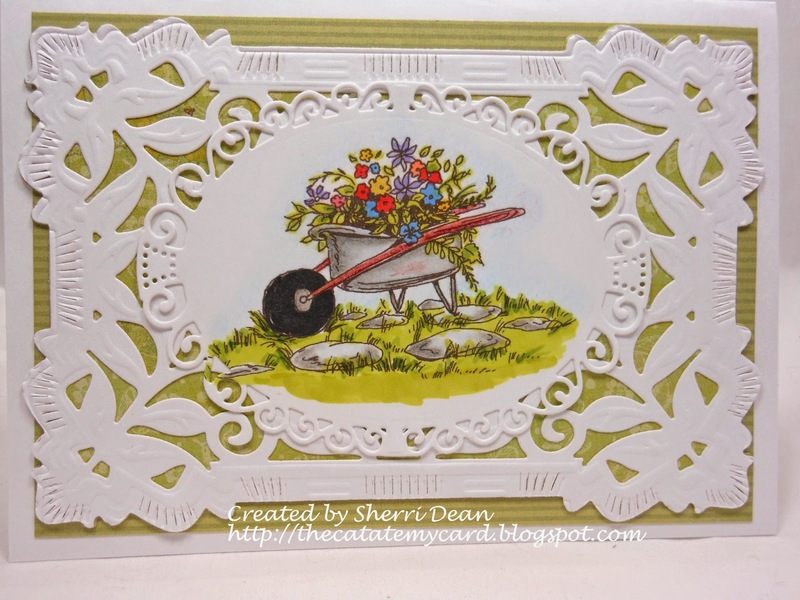 I love all the detail in the Cordoba die and your wheelbarrow is colored perfectly! Great card. Fantastic Sherri! This gorgeous die really showcases your beautifully colored image perfectly! Well done!